The Six of Pentacles means is that you are in a position where you have a good relationship with your income. Like the main figure in the card, the amount of money that you bring in and your expenses are balanced well, and you are fortunate enough to not have any stress. You are also grateful for all that you own and can happily share your wealth with others. As you can tell from the imagery in the card, the Six of Pentacles can be about charity. You can either be the man giving away money to the needy, or a beggar gratefully receiving what you need from wealthy donor. As you can tell from the imagery in the card, the Six of Pentacles can be about charity. You can either be the man giving away money to the needy, or a beggar gratefully receiving what you need from wealthy donor. If the card is showing that you are the giver, you have built up wealth, and you are now able to help others with financial assistance. You may have lived long enough in the darkness of the Five of Pentacles to be able to see the light. You are thinking about giving to charities or helping someone who could need your support and was in the same position you were before. The Six of Pentacles does not have to be about material gifts or money, it can also mean your time and presence. If the card is showing you are one of the beggars, you could be receiving someone else s charity. This could help you recover, so take the help - you will be able to repay the kindness in the future. You may also be able to find ways of becoming self-sufficient in the future. Despite this situation, you should be mindful that you should not become desperate or submissive during this time. The Six of Pentacles reversed can suggest that charity can be one-way. If you have loaned someone money, you should not be expecting your money to be paid back, or your favor to be returned in the future. You should be cautious about the people you are lending money to, especially if you are not financially stable. You could also have problems with spending and giving away more than you can really afford. 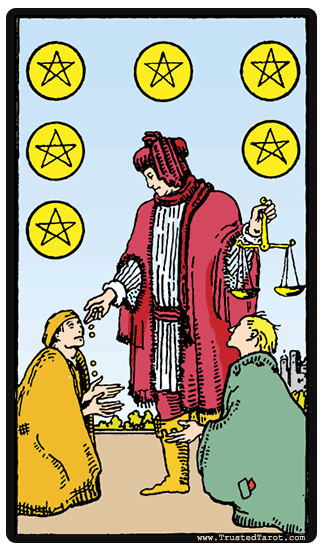 The Six of Pentacles reversed can also warn you about the debts that you have. This could mean that you are in over your head and it is going to come back and be a major problem in the future. You should also be careful of entering business endeavors during this time because you could end up with a huge loss, instead of getting a return on your investment. The last Six of Pentacles reversal meaning is that there is selfishness related to giving and charity. This may mean that you are willing to give others in a way that is not to benefit them, but to benefit yourself. You should be cautious that you are not just being charitable to prove you are giving or generous to others. The source of generosity should be selfless, not selfish.